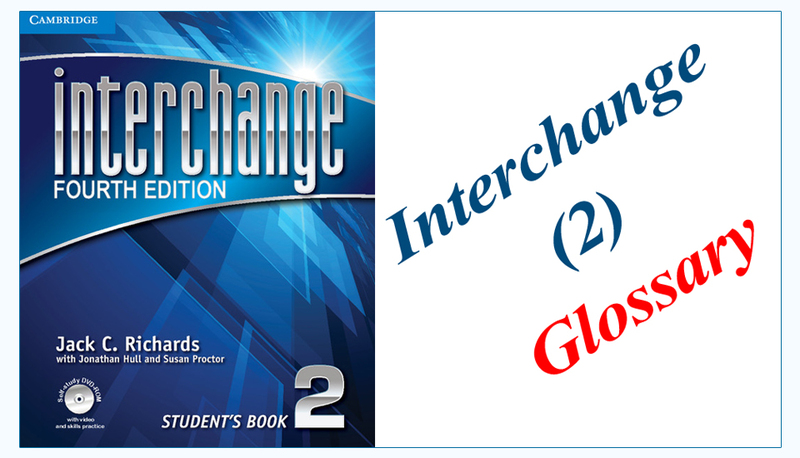 New Interchange 2 is a multi-level series for adult and young-adult learners of English from the beginning to the high-intermediate level. Student’s Book A contains units 1 8, the first half the of the complete Student’s Book. The Level 2 Student’s Book builds on the foundations established in Level 1 for accurate and fluent communication, extending grammatical, lexical, and functional skills. In the article below Interchange 2 glossary is provided from unit-9 up-to unit 16. 1. Grocery (N) A shop where items of food are sold. 2. Multiplex (ADJ) Having several separate screens within one building. 3. Intonation (N) The fall and rise of voice in speaking. 4. Prediction (N) A forecast, the action of predicting. 6. Charity (N) The voluntary giving of money to those in need. 7. Interrupt (V) To stop continues progress of something by saying or doing something. 8. Inherit (V) Receive (money, property or a title) as an heir at the death of ex holder. 1. Employer (N) A person or organization that employees people. 2. Broke (IDM) Having no money. 3. Diapers (N) A baby’s nappy. 4. Cruise (V) A sea or lake voyage specially one taken for pleasure. 5. Traits (N) Particular quality in one’s personality. 6. Cover letter (N) A letter that introduce a resume or curriculum vitae. 7. Resume (N) A summary of education and employment experience. 8. Bilingual (ADJ) Speaking two languages. 9. Consider (V) To think. 10. Counselor (N) A professional who guides people in careers, problems & education. 11. Realistic (ADJ) Representing things in a way that is accurate to life. 12. Curious (ADJ) Overly interested. 13. Analyze (V) Identifying and examining problems. 14. Persuade (V) To convince someone, make someone believe something. 15. Conventional (ADJ) Based on or in accordance with convention (agreement). 16. Investigative (ADJ) Investigating and seeking to expose the miscarriage of justice. 17. Attitude (N) Way of thinking or behaving. 18. Shortage (N) Lake of something. 20. Reliable (ADJ) Trust able. 1. Landmark (N) Important events. 2. Statue (N) Figure a person. 3. Radium (N) Radioactive chemical elements used in treatment. 4. Cattle (N) Cows that are kept as farm animals. 5. Lobster (N) Shell fish with eight legs. 6. Oyster (N) Large flat shell fish. 7. Consume (N) Using something. 8. Cultivate (V) Prepare and use land for growing plants and crops. 9. Textile (N) Any types of fabrics made by weaving. 10. Industry (N) Production of goods, company. 11. Volcano (N) Mountain with opening through which hot gases are force out. 12. Currency (N) A unit of money. 13. Pickle Veg (N) Vegetables that have been preserved in vinegar or salad water. 14. Nutritional (N) Healthy food. 15. Complementary (ADJ) Expresses admiration for something. 16. Gooey (ADJ) Soft and sticky food. 1. Dropout (ADJ) A person who leaves colleges without finishing. 3. Accomplishments (V) Things done or achieved after lots of hard work. 4. Slip (V) Slide accidently or almost fall. 7. Miraculous (ADJ) Lucky thing that happens without expectations. 9. Pursue (V) Do something to try. 10. Prodigy (N) A young person who is unusually intelligent. 11. Praise (V) Express admiration. 12. Suspect (V) A person suspected for doing wrong. 13. Artist (N) A person who creates work for artists. 14. Soloist (N) A person who plays an instrument. 15. Coast (N) Seaside, connected to the sea. 16. Coincidentally (ADV) Two things happening at the same time. 17. Crayon (N) Stick used for drawing. 1. Horror (N) Something causing feeling of great fear or shock. 3. Novel (N) Long written story. 5. Amuse (V) Make somebody laugh or smile. 6. Absurd (ADJ) Unreasonable, ridiculous. 12. Burglar (N) A person who breaks into the buildings to steal things. 13. Hilarious (ADJ) Very amusing. 14. Script (N) Text of play, speech or film etc. 16. Chase (V) Run, drive etc. after in order to catch them. 17. Alien (ADJ) Strange and frightening. 18. Critics (N) A person who gives opinion about good or bad qualities. 20. Witchcraft (N) Use of magic powers especially evil one’s. 21. Cramped (ADJ) Having too little space. 22. Wizard (N) A man who has magical powers, especially in legends and fairytales. 23. Adventures (N) A remarkable occurrence or experience. 1. Gesture (N) Facial expression or eye behaviors in order to emphasizing in speech. 2. Body Language (N) Movement of head or hand to show an idea or feelings. 4. Twirl (V) Spin quickly and lightly round. 5. Wrinkle (N) A line or crease on skin, especially caused by age. 6. Annoy (V) To do something repeatedly to upset or anger someone. 7. Disgust (V) Strong disapproval. 8. Embarrass (V) Cause to feel awkward, self-conscious or ashamed. 9. Exhausted (ADJ) Tired out completely. 10. Frustrate (V) To disappoint or defeat. 13. Pearl (N) Hard and precious stone, highly prized stone. 14. Wisdom (N) The ability to distinguish bad from the good. 15. Proverb (N) A short pithy saying in general use, stating a general truth or advice. 16. Impressive (ADJ) Appealing, exciting one’s attention and feelings. 17. Impatient (ADJ) Having or showing patience or tolerance. 1. Detective: (ADJ) An undercover police officer, an investigator. 2. Admit (V) To accept. 4. Jewelry (N) Rings, necklace and bracelets made of precious metals. 5. Deny (V) To denounce or to reject. 6. Lend (V) Allow (someone) to use (something) in order to return that. 7. Predicament (N) A difficult situation. 8. Cushion (N) A soft cloth bag used for sitting, kneeling or resting one’s head on etc. 9. Columnist (N) A journalist who writes a column in a newspaper or magazine. 11. Rumor (N) A fake story or statement that cannot be trusted on. 12. Dilemma (N) A situation in which a difficult choice has to be made between two or more alternatives. 13. Distraught (ADJ) Deeply hurt, saddened or worried. 1. Excuse (N) A defense or justification of a fault or offence. 2. Greasy (ADJ) Having a slippery surface because of having grease. 3. Criticism (N) The act of criticizing. 4. Regret (V) To feel sorry about something that already happened, after think. 5. Sympathy (N) A feeling of pity or sorrow for the suffering of others. 6. Nephew (N) A son of one’s brother or sister. 7. Intention (N) The purpose behind an action, aim or goal. 8. Protect (V) To keep safe something or someone.